Quick Links: Add a Circuit Question (2012 Tacoma TRD) Spark Plugs: 1 GR-FE Can I change only 3? Is there a good cheap way to weld aluminum? 120v Shower/Washdown in Bed ELM327 Mini Bluetooth Pairing Rear ABS Connector Wires Broken - Help needed. weird pop, and weird steering...? Discussion in 'Technical Chat' started by drifter, Oct 9, 2010. Ok, today I got stuck in a little bit of mud. I had to be pulled out backwards 5-10 feet. After getting towed out, I took off and started to leave. After 15 feet or so I heard this loud pop. I kept driving and briefly checked under the truck to see if everything was ok when I stopped a few minutes later. 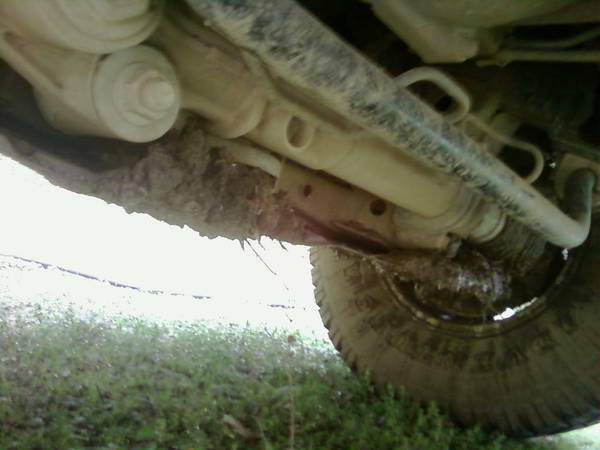 I didn't see anything except some mud jammed between the skid plate and the rack-and-pinion stuff. Later on, while backing out of a parking space, I noticed my front tires were about straight on, and my steering wheel was 45 degrees off center or so. Once I started driving it went back to normal, but it will still do it if I stop and turn the wheel some. Is this normal? I checked the slop between the wheel and the shaft down at the firewall...there's a slight amount of movement. My steering wheel tilts if that helps any...been reading some stuff on steering problems, so I thought I'd add that in their.